Despite the loudness of the birds in the forest, it was a good first night in the tent. I realized that even though the tent was less comfortable than a hotel room, I liked it better overall. I like being camped in my own little space, with my lamp and sleeping bag and a good book on the Kindle. The birds finally got quiet at some point late in the night, and it was very peaceful when we all emerged from the tents around 6 a.m. Being that it was still fairly buggy, the trick after my Clif bar breakfast was to take a shower at the bathhouse and get back in motorcycle gear before the black flies descended. I didn’t want to oil up with DEET again right after washing all that stinky stuff off. I managed this feat and we had everything packed up and ready to hit the road by 8 a.m. As we passed out the campground gate (which was still locked) we found the office hadn’t yet opened, so we made a note to call later to pay for our night’s stay. It really was off-season here. Our location was alongside the river and near the highway, but not near any restaurants at all. Unless we backtracked to Saguenay, the nearest meal would be in Tadoussac, 72 miles along the “Route Fjord” (Rt 172). It was a chilly but clear morning and I didn’t mind the winding ride past the big rocky outcrops at all, covering miles until we could stop for a real breakfast. This turned out to be at a cute Victorian house converted into “Cafe Boheme,” as seen above. The breakfast was massive and good. I sent a photo of it to Eleanor and she wrote back, “I won’t worry about your meals anymore.” (But little did we know that the quality of meals was destined to go generally downward after this.) We met some visitors from Montreal who told us about an upcoming music festival in Tadoussac, which explained why trucks were unloading pallets of beer at the church across the street. The weather wasn’t warming up after Tadoussac, so we stopped off to add some layers by a waterfall that we discovered while paralleling the north shore of the St. Lawrence. Clothing layering is the key to comfortable riding, so we all packed a very flexible arrangement of clothes to meet all the weather we might encounter. For the coldest possible situation I had many layers: a full set of polypropylene long underwear, heavy socks, long sleeve shirt, a lightweight Primaloft jacket, wind/dust/rain liner, armored motorcycle jacket and pants, neck warmer, gloves, and a full BMW rain suit in bright yellow. Today I was fine without the long underwear but I definitely needed the Primaloft jacket and wind liner under my motorcycle jacket, as a cool breeze blew down from the north. Weather was on our minds this day. There wasn’t much to distract us between Tadoussac and Baie Comeau, and the reports I was getting on the phone told us that the nice weather would disappear by Friday, just when we planned to be touring Gaspé. 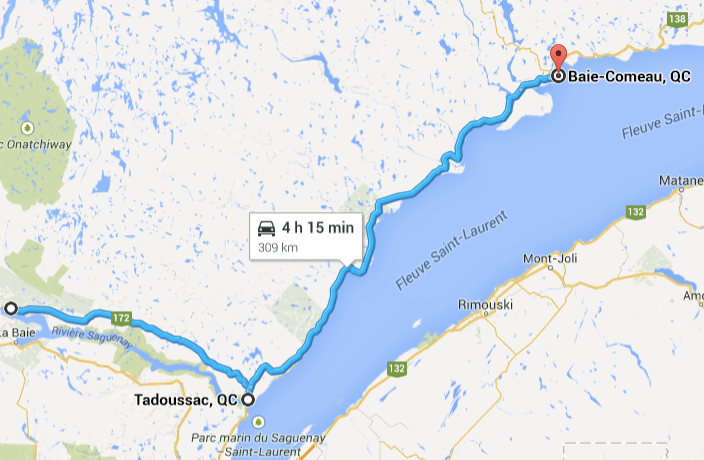 Since there were few detours, we covered the distance to Baie Comeau by 3:00 pm. The rest of the afternoon was blown wandering around town trying to find the ferry dock (which we missed initially because of a road construction detour), and the campground. Steve thought he had all the key points pegged in his GPS but the coordinates stored there brought us to a Hyundai dealership. We tried Google Maps and it sent us on another wild goose chase. A paper map also had the campground in the wrong place. Finally we just followed a road sign and got there with no problem, which just shows that low tech is sometimes best. Before heading to the campground, we dropped in on the ferry dock to reserve a ride across the Seaway to Matane, QC for the next day. The choice was either the 2:00 pm ferry from Godbout, a tiny outpost 60 km further northeast, or an 8:00 pm ferry from Baie Comeau. We had to weigh this carefully, since Steve’s plan for the next day was a huge ride up to Manic 5 and back. We booked the 8:00 ferry for the next day, and headed to the campground to set up for the night. Manic 5 is an enormous hydroelectric dam on the Manicouagan River, which is a sought-after destination by many adventure riders. The trip is 221 km each way (136 miles from our campground), and the average speed is about 40 MPH. At the dam’s location we would find a little motel, a restaurant, a gas station, and not much else—and then we’d have to run around and come all the way back to Baie Comeau. That’s a total of seven hours of riding time round-trip. We had already over 700 miles in three days, and I was tired and not particularly psyched to face seven hours of riding in one day to see a dam. Once again I was envisioning a fairly flat and uninteresting ride through Quebec wilderness—based on the dull ride up to Baie Comeau. I had been willing to do the long ride in order to take a tour of the interior of the dam, but it turned out that dam tours didn’t start until June 24 (that “off season” thing had bit us again), and this took a lot of the incentive out for me. Steve didn’t care about the tour, and in fact didn’t even know there was one. He just wanted the ride. It seemed early in the trip for a rebellion, but I was really tired at that point and said I would rather just wait in Baie Comeau for them to come back. We debated it for a while, and finally that evening over dinner at some forgettable restaurant in town Steve “took one for the team” and said we could skip it. But he was bummed out about it. Back at the camp we were not entirely happy either. The campground wouldn’t let us pitch three tents on one site, and charged us CDN$66 for two sites, which was nearly what we would have paid for a hotel room in town. It was one of those places kind of like a KOA: a bit self-important, pricey, a curious mixture of “camping” and Motel 6, staffed gate with electronic keycards, and lock-down at 9 p.m. The tent sites were strange too, comprised of little clearings in a forest with recent grass sod. The black flies were fairly friendly, so it was another DEET night for all of us. The electricity in the tent camping loop was turned off so I couldn’t recharge my stuff, but I got a quick charge during dinner (I learned to look for booths with obvious power outlets nearby), and later discovered that the campground bathroom had power too. So I plugged the iPhone and helmet intercom in while I showered, and hoped that after a good night’s sleep I’d have a better perspective on the day ahead. Nice area of the country (which I’ve not yet seen), but that’s a bit steep for a couple basic sites. With no juice.Yikes.